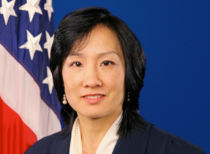 Michelle Lee is a remarkable speaker who offers unique perspectives resulting from her experiences in the trenches of innovation at the MIT AI and HP Research Labs, at Google during its rise from small company to global powerhouse, and as the head of the U.S. Patent and Trademark Office where she witnessed first-hand inventions from across the globe. Her presentations not only journey thru the newest and most advanced technologies, but also examine the business opportunities and regulations that will be key to our future. There is nobody else who has her unique experience at the highest levels as a scientist, businesswoman, attorney and government executive, and there is no presentation that is as effective at providing a complete picture for business leaders.